Eforos—the word for fertile in Greek—is a system blueprint for the collection and recycling of used feminine hygiene products. It is inspired by the “Leave No Trace” ethos, and the extra care women have to take when having their periods while engaging outdoor activities. Despite the introduction of innovative products like Thinx underwear and the menstrual cup in the feminine hygiene product market, the majority of women still use tampons and pads during menstruation. These products are one-time-use, and are traditionally disposed of in landfills. Given that a woman might use 17,000 pads in her lifetime, and that about half the world’s population menstruates, Alexia decided to investigate ways in which to turn this traditionally linear and wasteful economy, into a circular one. Through the Eforos system blueprint, designed for urban environments, the used menstrual products—which include both synthetic and natural materials and are already typically separated in women’s bathrooms—are gathered using the Eforos Bin, which attaches to the edge of the classic trash barrel that custodial staff use to collect the rest of the trash. They are then sent to a special facility not unlike the "Knowaste" recycling facility in the UK, which has proven that these materials can be separated and re-introduced into a technical cycle (i.e. plastics are refined and made into new products, while natural materials can be composted and used to grow more cotton); transforming a traditionally wasteful and linear process into a circular economy. The effort would be rolled out in collaboration with public schools in NYC, starting with used products being collected from about 10,000 women and girls. This first effort has the potential to divert approximately 33 metric tons of material from landfills every year, with further impact as it is adopted by more schools across the city. 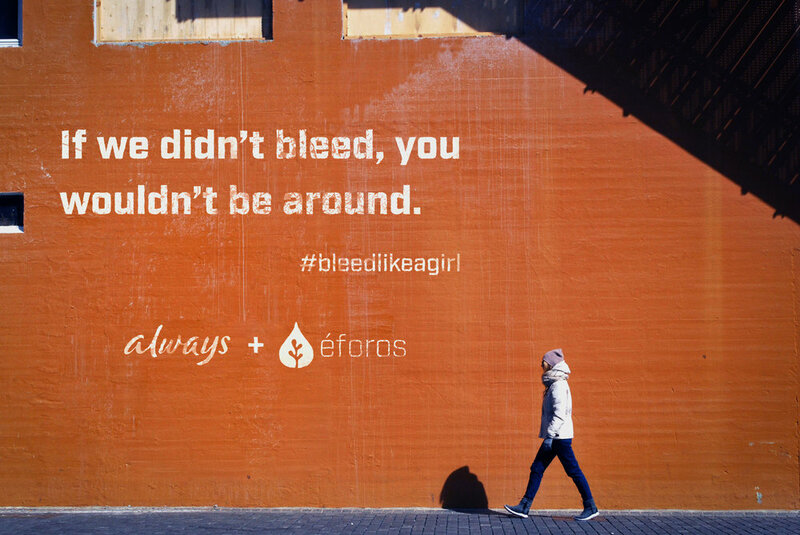 Partnerships with the city of New York and brands like Always, celebratory campaigns, as well as educational programs in public schools, would work together to make periods something to celebrate and not to dread.